Yes that could work but be mindful of only adding a tiny drop to not affect the working of the ink itself. You could also dress the refill ink cartridge in oil (or smoke it in incense) prior to assembling your pen. You suggest using multiple oils at a time and I would not be adding all of that directly to your ink. Swap out refill cartridges if you intend to use your pen for multiple purposes, and dress each cartridge accordingly. You may also be interested in Lucky Mojo's Dragon Blood ink, which is used in writing spells and petitions out. Thank you both Miss Athena and JayDee. I will take it all into account. Keep getting references to Has No Hannah oil in my studies (it’s mentioned in Black and White Magic Of Marie Laveau for the gambling hand). I may be wrong but is this a name for something else? (Hurston calls it jasmine). Jasmine doesn’t seem right for a luck hand. What are it’s uses? Jasmine is used for psychic vision and can help you dream of lucky numbers when combined with hops, calendula and chamomile. So it is a good ingredient for spell work to win at gambling or other games of chance. It's also used in love-drawing work. Has No Hanna is an old New Orleans formula for gambling luck and most recipes for it call for jasmine as a key ingredient. It's believed that the name is a variation on "hasnuhana" which is the Bengali word for night-blooming jasmine. 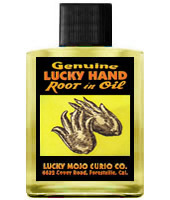 What’s the best Lucky Mojo oil to use when Has No Hanna is called for? Hi everyone! I was finally able to buy the oils I needed for my daughter (hooray!) I just have a quick question about them though. I bought Crown of Success, John the Conqueror and King Solomon oil, I will buy the others in my next order in a couple of weeks. My goal (incase you didn't read my post from a few weeks ago in another forum) is to help her with school and dance, she has ADD and I want to help her be successful in both. She's only nine and I've already been told that she's going to be placed into 5th grade, but they have three big test coming up in April and May (the FSA) and then she also has her end of the year ballet recital in June where she will preform her solo. She barely passed the FSA last year and it knocked her confidence down quite a bit. She's really smart and is doing a lot better in school, but she's not doing as great as she should. She learns differently then most kids and can do most of the work in her head but even if she gets things correct the teacher marks them wrong because she forgot to show her work. She's done great raising her grade from a C to a B in reading, but is having problems with things like writing complete paragraphs for essays. When it comes to reading passages she can't do it if the teacher is reading the passage out loud, but if she has a physical copy of the passage she gets all of the answers correct. I've already asked if there was a way that she can have physical copies because I know that would help her tremendously, but the teacher told me no. She really needs to pass these test and better learn the curriculum. I believe it would also help increase her confidence. I'm hoping that the combination of the three oils will help her be successful, but I was wondering if I can add the oils into the detangler spray that I use in her hair every morning. I don't think that she'll let me put them on her directly and even if she did I know that she would probably tell my mother and that would just cause a huge argument between us since my mom is against hoodoo and all magic/spells in general. I'll eventually get the bath salts and either put them in her bath or in the washing machine with her clothes, but for now I've only gotten the oils since I've has success with previous oils that I've used on myself. I'm going to guess that it's okay to put the oils in her detangler, but then again I'm not sure if the ingredients from the detangler somehow lessen the oils effects. Can you think of a better way to sneakily get the oils on her? Thank you in advance for your help, have a great day! Sorry for the long post, I meant for it to just be a short one but got carried away. Sorry again and thank you! Add the oils to shampoo or conditioner, body lotion, or apply to your hands and rub in her hair. Can also put some in her shoes and wipe it in the inside. You may find sachet powders to dust her clothing with and items she touches. You can have the church light candles for you and they will send an email report on the candle burn. Practical level, does your daughter have an IEP (Individual education Plan) that comes with students with disabilities? If so review it and make sure the teacher is not violating it by refusing to give the document or grading her down for things that she is covered by in her IEP, IEP fall under federal law. You can use oil such as commanding and influence on the school when dealing with them. 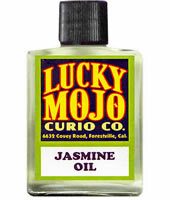 Can anyone provide the specific measurements of the lucky mojo bottles? I’m looking to see if they will fit in this special cabinet I’ve found before I order enough to fill it. If you are referring to the individual bottles of oils, they are about 2 and 3/8 of an inch tall including the cap. I hope this helps. Good luck stocking your special cabinet! Hi Miss Athena, I suppose I should have been more specific. Can you tell me the width of the bottles? thank you so much! Clear flint glass rectangular bottle holds one half ounce fluid measurement; comes complete with black plastic cap. Im am just entering this forum, and I am already learned some interesting ways to use the oils as well as combinations. My only question on the dressing of the candles, I have a proble with keeping the dressing around the candle. Any suggestions ? To use oil to dress a candle just means to rub it n with your fingers -- like dressing leather with harness dressing. You do not pour it on.